Objectives: Preservation of renal function is an important issue after living donor liver transplant. We aimed to examine the renal protective efficacy of telbivudine in hepatitis B virus-infected patients after living donor liver transplant. Materials and Methods: In this retrospective study, we compared 18 patients who received telbivudine 600 mg once per day and 23 patients who received entecavir 1 mg once per day after living donor liver transplant. Clinical data were obtained through chart review and included Model for End-Stage Liver Disease score and pre- and postoperative aspartate aminotransferase, alanine aminotransferase, and creatinine levels and estimated glomerular filtration rate. Results: Posttransplant estimated glomerular filtration rates and creatinine levels were calculated, and improvement of renal function was found in the group of patients who received telbivudine. 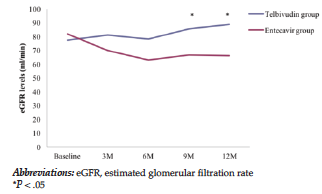 Significant improvements were shown in estimated glomerular filtration rates started after 9 months of administration and creatinine levels after 12 months compared with patients who received entecavir. Conclusions: In our study, long-term telbivudine therapy is associated with a sustained improvement of renal function in patients with hepatitis B virus infection after living donor liver transplant. Reactivation of HBV infection negatively affects the benefits of liver transplant. Thus, posttransplant HBV prophylaxis becomes an important issue to ensure the control of HBV infection. In addition, prophylactic use of anti-HBV agents can reduce the risk of HBV reactivation and survival outcomes after liver transplant. However, the use of those agents has been shown to interfere with posttransplant renal function, especially in recipients with pretransplant renal insufficiency. Pretransplant renal disease and calcineurin inhibitor-based immunosuppression are the main contributing factors to posttranplant renal function impairment. Therefore, preservation of renal function and prevention of renal dysfunction must be considered during the choice of medication in these patients. Current oral antiviral treatments for HBV include 2 nucleotides and 3 nucleosides. Most of these antiviral agents may cause renal dysfunction and need dose adjustment.4-6 Telbi­vudine is a synthetic thy­midine nucleoside analogue, shown to provide renal protection in the treatment of patients with chronic hepatitis B.7 However, studies that have investigated the effects of telbivudine on renal function in HBV-positive patients after LDLT are scarce. Herein, we aim to examine the renal protective efficacy of telbivudine in HBV-infected patients after LDLT. This was a cross-sectional retrospective study of 143 patients with end-stage liver disease who underwent right lobe LDLT at the Changhua Christian Hospital from May 2010 to June 2014. Patients who had already received LDLT at least 4 weeks before the screening visit and with documented chronic HBV infection were included in our study. These patients received right lobes of living liver graft from their relatives. During transplant, HBV was eradicated by the administration of hepatitis B immunoglobulin. After transplant, immunosuppression regimens included tacrolimus, mycophenolate mofetil, and steroids. Of 41 patients included with chronic HBV infection, 18 patients received telbivudine 600 mg once per day and 23 received entecavir 1 mg once per day for up to 12 months after LDLT. Clinical data were obtained through chart review and included Model for End-Stage Liver Disease score as well as pre- and postoperative aspartate aminotransferase, alanine aminotrans­ferase, and creatinine levels, and estimated glomerular filtration rate (eGFR). The study protocol was approved by the hospital’s institutional review board. On-treatment response at week 24 has been shown to be predictive of a longer-term response. Hepatitis B virus DNA levels were monitored at 24 weeks of treatment to ensure complete viral suppression (HBV DNA < 300 copies/mL). For patients with detectable HBV DNA after 24 weeks of therapy, treatment modification should be considered. Hepatitis B virus DNA was monitored every 6 months to ensure continued response. Data were recorded in a computer database. For the efficacy analyses, evaluable patients were defined as all patients, entered in accordance with inclusion and exclusion criteria, who had 8 weeks of treatment and who had valid data for the efficacy measures on at least the baseline visit and/or visit 3 (week 36). We used the chi-squared test or Fisher exact test for categorical comparisons of data and the Mann-Whitney U test to determine differences in the means of continuous variables. 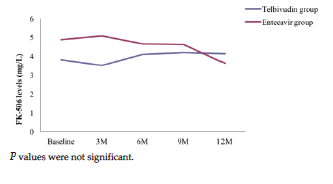 A P value of < .05 was considered as statistically significant. All statistical analyses were performed with the statistical package SPSS for Windows (version 16.0, SPSS Inc; Chicago, IL, USA). During the study period, 18 patients (mean age, 55.52 y; range, 40-68 y) received telbivudine and 23 patients received entecavir after LDLT (Table 1). Mean level of eGFR in the telbivudine group was 77.3 mL/min at baseline, increasing to 81.1 mL/min at month 3. The mean levels of eGFR were significantly higher in the telbivudine group than in the entecavir group at 9 months (85.66 vs 66.69 mL/min; P < .05) and 12 months (88.87 vs 66.18 mL/min; P < .05) (Figure 1). Regarding changes in postoperative creatinine levels, mean creatinine level in the telbivudine group was 1.45 mg/dL at baseline, decreasing to 1.03 mg/dL at month 3. The mean levels of creatinine were significantly lower in the telbivudine group than in the entecavir group at 12 months (0.91 vs 1.24 mg/dL; P < .05) (Figure 2). 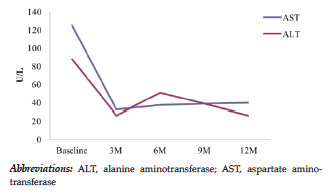 However, there were no significant differences in aspartate aminotransferase and alanine aminotransferase levels between the 2 groups (Figure 3). Similar results were found in FK-506 levels, and there were no significant differences in FK-506 levels between the 2 groups (Figure 4). Renal dysfunction is common in patients with end-stage liver diseases and is an important safety issue after liver transplant.8,9 Renal dysfunction after orthotopic liver transplant is also associated with worse outcome. The incidence of renal failure after orthotopic liver transplant ranges from 12% to 70%.10 Several factors should be considered regarding renal dysfunction after liver transplant.11 Damage from some medicines is one of the major causes of renal dysfunction. Posttransplant immunosuppression avoids the incidence of graft rejection and maintains graft survival. However, a number of complications are also caused by immunosuppression. Calcineurin inhibitor-related nephrotoxicity is one of the major complications caused by immunosuppression after liver transplant.12 Anti-HBV prophylactic agents also induce renal dysfunction. The prophylactic use of anti-HBV agents may interfere with posttransplant renal function, especially in recipients with pre­transplant renal insufficiency. Minimal decline of renal function has been reported with all nucleoside/nucleotide analogues for the treatment of HBV and except for perhaps telbivudine. The European Association for the Study of the Liver clinical practice guidelines recommend appropriate dosing adjustments of antiviral therapy for HBV patients with creatinine clearance < 50 mL/min to prevent renal dysfunction.13 In the present study, we compared the renal function and clinical parameters in 2 groups of patients who received entecavir or telbivudine after LDLT. Entecavir is a cyclopentyl guanosine nucleoside analogue and has high efficacy in HBV DNA suppression with lower drug resistance. However, it is more expensive than other anti-HBV nucleoside analogues. Telbivudine is a thymidine nucleoside analog and has an anti-HBV effect as a potent inhibitor of HBV replication. The benefits of telbivudine on eGFR have been reported regarding treatment of patients with HBV-related decom­pensated cirrhosis. In our study, the serial changes in improvement in eGFR levels and creatinine levels were demonstrated in patients who received telbivudine. The renal protective effect on eGFR by telbivudine starts 9 months after liver transplant, with no renal protective effects shown with telbivudine treatment within 24 weeks in clinical studies. Perrella and associates found no obvious benefits with short-term use of telbivudine in patients within 6 months after orthotopic liver transplant.14 However, in a 2-year global trial, Gane and associates showed that eGFR improved at week 40 after treatment with telbivudine in patients with chronic hepatitis B.7 The duration of telbivudine administration may play role in the renoprotective effect. The mechanisms governing the renal protective effects of telbivudine remain unclear and need to be investigated. The possible renal protective effects of telbivudine may arise from improvements in kidney structures or inflammatory/fibrotic pathways. Chan and associates suggested that telbivudine could increase blood flow to improve tubular dysfunction.15 McKeage and team proposed another mech­anism of renal protection of telbivudine excretion through passive diffusion, which would not result in mitochondrial DNA depletion or toxic effects on function of renal tubule cells.16 Liang and associates showed that downstream effects by telbivudine decreased serum angiotensin-converting enzyme levels to inhibit the renin-angiotensin aldosterone regulatory system, with eGFR significantly increasing after long-term telbivudine treatment.17 However, the lack of improvement in renal function with short-term telbivudine treatment cannot be answered by these hypotheses. The main limitations of our study include the small sample size, relatively short observation duration, and its retrospective design. Thus, clinical prospective trials with greater numbers of patients and greater long-term outcomes are needed to clarify the renoprotective effect by telbivudine. In our study, long-term telbivudine therapy is associated with a sustained improvement of renal function in patients of HBV after LDLT. The benefit of renal protection will start after 9 months of telbivudine usage. With this preliminary finding, we suggest that it is essential to conduct a further study to clarify the mechanisms of telbivudine in renal function. Hou J, Liu Z, Gu F. Epidemiology and Prevention of Hepatitis B Virus Infection. Int J Med Sci. 2005;2(1):50-57. Kim WR, Poterucha JJ, Kremers WK, Ishitani MB, Dickson ER. Outcome of liver transplantation for hepatitis B in the United States. Liver Transpl. 2004;10(8):968-974. Maluf DG, Stravitz RT, Cotterell AH, et al. Adult living donor versus deceased donor liver transplantation: a 6-year single center experience. Am J Transplant. 2005;5(1):149-156. Fontana RJ. Side effects of long-term oral antiviral therapy for hepatitis B. Hepatology. 2009;49(5 Suppl):S185-195. Kim YJ, Cho HC, Sinn DH, et al. Frequency and risk factors of renal impairment during long-term adefovir dipivoxil treatment in chronic hepatitis B patients. J Gastroenterol Hepatol. 2012;27(2):306-312. Mederacke I, Yurdaydin C, Grosshennig A, et al. Renal function during treatment with adefovir plus peginterferon alfa-2a vs either drug alone in hepatitis B/D co-infection. J Viral Hepat. 2012;19(6):387-395. Gane EJ, Deray G, Liaw YF, et al. Telbivudine improves renal function in patients with chronic hepatitis B. Gastroenterology. 2014;146(1):138-146.e5. Bahirwani R, Campbell MS, Siropaides T, et al. Transplantation: impact of pretransplant renal insufficiency. Liver Transpl. 2008;14(5):665-671.
de Jongh FE, Janssen HL, de Man RA, Hop WC, Schalm SW, van Blankenstein M. Survival and prognostic indicators in hepatitis B surface antigen-positive cirrhosis of the liver. Gastroenterology. 1992;103(5):1630-1635. Afonso RC, Hidalgo R, Zurstrassen MP, et al. Impact of renal failure on liver transplantation survival. Transplant Proc. 2008;40(3):808-810. Lee JP, Heo NJ, Joo KW, et al. Risk factors for consequent kidney impairment and differential impact of liver transplantation on renal function. Nephrol Dial Transplant. 2010;25(8):2772-2785. Ziolkowski J, Paczek L, Senatorski G, et al. Renal function after liver transplantation: calcineurin inhibitor nephrotoxicity. Transplant Proc. 2003;35(6):2307-2309. European Association For The Study Of The L. EASL clinical practice guidelines: Management of chronic hepatitis B virus infection. J Hepatol. 2012;57(1):167-185. Perrella A, Lanza AG, Santaniello W, et al. Telbivudin as prophylaxis for hepatitis B virus recurrence after liver transplantation: a case series in single-center experience. Transplant Proc. 2012;44(7):1986-1988. Chan HL, Chen YC, Gane EJ, et al. Randomized clinical trial: efficacy and safety of telbivudine and lamivudine in treatment-naive patients with HBV-related decompensated cirrhosis. J Viral Hepat. 2012;19(10):732-743. McKeage K, Keam SJ. Telbivudine: a review of its use in compensated chronic hepatitis B. Drugs. 2010;70(14):1857-1883. Liang KH, Chen YC, Hsu CW, Chang ML, Yeh CT. Decrease of serum Angiotensin converting enzyme levels upon telbivudine treatment for chronic hepatitis B virus infection and negative correlations between the enzyme levels and estimated glumerular filtration rates. Hepat Mon. 2014;14(1):e15074. Acknowledgements: Yao-Li Chen, Kuo-Hua Lin, Chia-En Hsieh, and Ping-Yi Lin designed the research study. Kuo-Hua Lin, Ping-Yi Lin, and Yao-Li Chen performed the research study. Kuo-Hua Lin and Chia-Cheng Lin collected data. Kuo-Hua Lin and Ping-Yi Lin analyzed the data. Kuo-Hua Lin, Yao-Li Chen, and Ping-Yi Lin wrote the paper. Yao-Li Chen and Ying-Zi Ming revised the paper. The authors have no conflicts of interest to declare, and no funding was received for this study.